Notes: Rosersberg Palace (Swedish: Rosersbergs slott) is one of the Royal Palaces of Sweden. 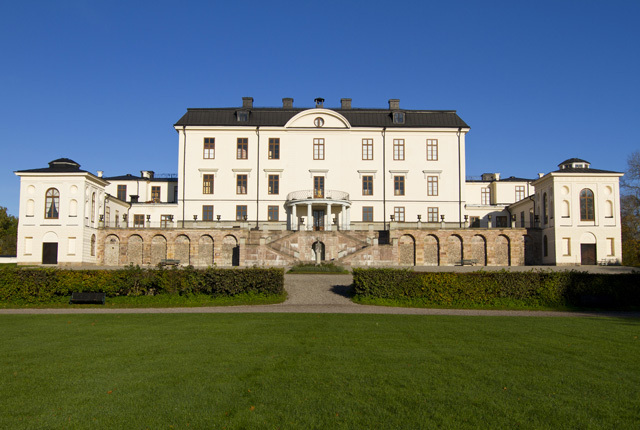 Situated on the shores of Lake Malaren, on the outskirts of Stockholm, it was built in the 1630s by the Oxenstierna family and became a royal palace in 1762, when the state gave it to Duke Karl (later Karl XIII), the younger brother of Gustav III of Sweden.The palace has a park which incorporates a French baroque garden commissioned by Bengt Oxenstierna, and designed and planted at the end of the 17th century by Tessin the Younger. At the time it was considered one of the most lavish gardens in Sweden, but much of the garden has become overgrown or been lost. The avenues and a 600 metre (1,968 ft) pond still exist. On the left hand side of the palace is an English garden with winding paths commissioned by Duke Karl around 1800.